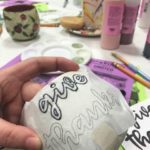 Life update: As You Wish Pottery, BABIES, and ShiftCon! I blinked — and suddenly my newborn is two months old, I’ve become acclimated to sleeping about 6 broken hours each night and it seems to be sunset right after the sun rises. Such is life with two kids, haha! I’ve been wanting to write this blog post for a solid eight weeks but at the end of the night there are bottles to wash, bills to pay, and Reddit posts to catch up on — so it’s been waiting impatiently in the corner of my brain for a night like tonight. Baby is currently bundled up in her Rock n’ Play (seriously, best invention ever. Get all your friends one (yep, that’s an affiliate link, so if you click it, I make a penny), Holly is dreaming of shoes and string cheese, and Matt is sleeping, preparing for his day on set. I’m wearing leopard leggings and just came back from Yoga. It was my first exercise class in a looooong time and let’s just say I have some work to do in terms of getting back in shape. But anywho, I digress. Let’s talk about two things I’ve had on my mind lately. 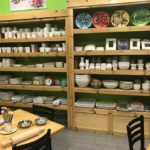 I was invited to a girl’s night out at As You Wish Pottery here in Valencia. 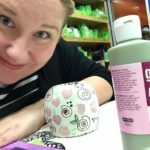 I had just had Hadley six days earlier – and while people were surprised I was out, I had a great time taking a break from babying and nursing, and painted an adorable stemless wine glass. Several of my blog buddies were there too, and the class was lead by the awesome Marketing Director, Liz, who was a very talented artist (she used to create all the display pieces) and a patient and fun teacher.One thing I loved about the class was that it was structured yet there was still plenty of opportunity to be creative and make the piece my own. One trick we used was to trace the lettering with a sharpie on to the pot through tracing paper, and then filled it in with the glaze. I felt like a real “Artiste” (say it with a French accent to add some flair) and I loved getting to be creative. 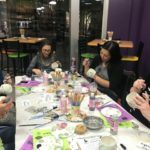 Liz kept telling us the theme of the night was whimsy – something I felt as I learned how to make puddle flowers, which is where you puddle the paint in one area to create an abstract, round flower shape. Isn’t it so cute?! Bloggy ladies hard at work. Self portrait of the Artiste. Tons of variety of things to paint! All of us with our beautiful pieces before they get fired. 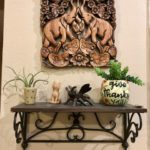 The finished product in my living room! I’d definitely consider bringing girlfriends here for a girl’s night out, and I’m thinking this might be a fun Mother’s Day activity to take my mama to. (Fun fact: Mother’s day is on my birthday this year!) I also want to take Holly and let her just go wild on one of the cute cat statues or plates they have. There’s a HUGE variety of things to choose to decorate, with prices starting as low as $6. Be sure to check out As You Wish near you – here in Southern California, we have three locations: Valencia, Simi Valley, and Palmdale. If you happen to be in Arizona, you’re in luck because there are many more locations in Arizona, too! When Holly is older I may very well host a birthday party here for her – prices start at $175 for eight kids and they each get to paint one item. Thinking about it now, I think I actually might take my bestie this weekend so we can catch up and gab while also unleashing our inner artistes. 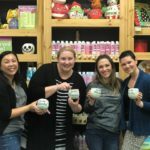 Thank you so much to As You Wish for hosting me and my blogger friends! One thing that’s quickly approaching is the end of my maternity leave (Waaah!). While I can admit I’m in some ways looking forward to getting back to work because it feels good to use my brain in ways other than mothering — (I’m doing a little freelance work here and there in product naming and it’s been refreshing to get creative with words again (yep! fun fact: I name toys! )), I am sad to leave my little Haddie. (But – our daycare is just a mile away and she’s with her sister Holly, so that will be great). However, one thing that will soften the blow is attending Shiftcon the last weekend in January! Shiftcon is a conference founded by my friend and business-savvy social media pal, Leah Segedie. 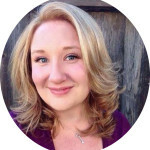 Leah is a pioneer in the green wellness space, and her conference is a really cool medley of social media and tech workshops, health and wellness presentations, and an expo with hundreds of natural and organic care leaders. While I’m “light green” in that I’m not super educated in green stuff like non-GMO and chemtrails and stuff, I am interested of course in learning how to adapt my lifestyle and keep my children’s diet and environment as natural as possible. Kia, me, and Leah rocking our Twitter skillz at Shiftcon 2016! I’m attending Leah’s conference as a volunteer, and I am really looking forward to some of the workshops like “Exploring the Hidden World of Fragrance” and ” Old School Promotion–How to Get a Book Deal & Media Coverage.” One thing that’s really awesome about Shiftcon is all of the meals are non-GMO and organically sourced. 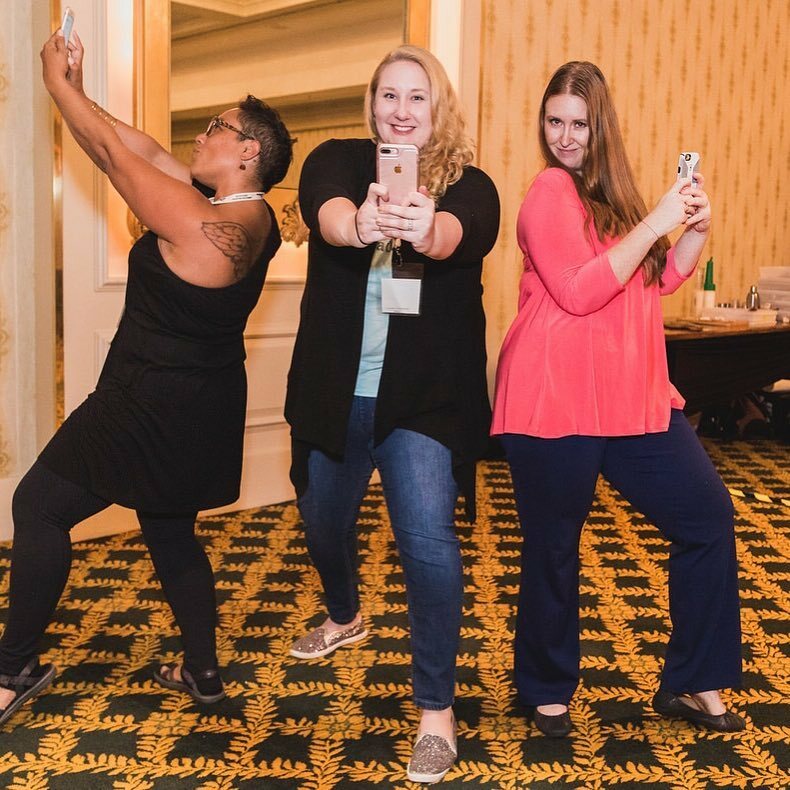 I volunteered at Shiftcon last year in New Orleans, and had a blast leading their Twitter Party, taking photos, and helping organize the mannequin challenge in a gigantic expo hall. Can’t wait to have fun and learn in February! Interested in joining me? The conference is in Irvine from February 1-3, and there’s just a few passes left! Ok – little miss just woke up for her nightly feed, so I better tend to my child. Hopefully I’ll be back soon and hope your 2018 is off to a swimmin’ start! I like silly memes, because that’s a large part of what the Internet is great for: cats sitting on Roombas and double rainbows. So when this challenge popped up, of course I had to contribute. Here’s me, in 3 fictional characters. 3. I’m still working out with a personal trainer and I have ALL THE SORENESS. Especially in my quads. Squat goals, am I right? Anyways, do you guys know the miracle of epsom salts? Cheap, fun to pour into the bath tub, and really helps soothe your aches and ailments. This is 31: extra creaky. Get you some. 4. I’m walking in the American Foundation for Suicide Prevention “Out of the Darkness” Walk in Santa Monica on October 15. If you’re local, I would love to have you join me on the walk. Please also consider making a small donation (Even $5 is put towards life-saving treatment.) Let’s end the stigma: more now than ever, people need our open arms so that we can tackle this public health problem head-on. 5. BONUS! It was only supposed to be four things, and you get FIVE! Poor Harambe – but oh, Internet, how you just keep going with the jokes. By the way, my patronus is an otter. What’s yours? Happy Friday, friends! Watch this space and the Double Chin Diary soon for a feature about PCOS (it’s PCOS awareness month!) and a yummy new recipe featuring Sambazon, Bob’s Red Mill, and Pic’s Peanut Butter. Mental illness. Two simple words so loaded with meaning. “She’s mental,” we said in high school, to describe someone who’s crazy. And illness, of course, meaning a sickness that takes over the body. When I think of mental illness, I think of the white jacketed men with butterfly nets and strait-jackets, of overblown images of someone in the throes of unmanaged schizophrenia. In reality, mental illness has a much more normal looking presence in many people’s lives, including my own. In the past few years, mental illness has been showing up more and more in the media. When Robin Williams took his life, the nightmare of depression made headlines, having successfully stolen America’s favorite funny man. Now, his wife claims it wasn’t depression that took Robin Williams, but Parkinson’s. No matter the reason Robin Williams took his life, his death, for a moment, caused a glimmer of hope in a hurricane of sadness. In his passing, Robin held up a candle for everybody suffering with mental illness. I have a personal history with mental illness, and though it’s big and scary to write something like this on the Internet, I’m quite open about it in person, so it’s time to share my story here. I have an anxiety disorder. Nowadays, people jokingly say they had a panic attack, meaning they got really worried when their boss called them into a meeting, or they lost their keys. Their fleeting few moments of stress is what pop-culture calls a panic attack, when in reality, a panic attack is a terrifying misfiring of the neurons and stress hormones in your brain. Have you ever had a real panic attack? If you have, I’m quite certain you don’t use that term for a mildly stressful situation. I was always a worried teen, fretting about getting in trouble or crashing the car. I had to be forced to learn how to drive because I had no interest in operating a giant machine capable of death, thank you very much. I felt stressed out a lot in high school but figured it was just my own pressure on myself to get good grades and be a “good kid”. Add a heaping dose of perfectionism and adolescent angst and you’ve got a recipe for panic. When I moved to Southern California for college, I rode my bike to class one day. I made it to class a few minutes late and rushed to the back of the room where there was only one seat left. I ran into the seat, embarrassed I was late, and sat down. Suddenly, I started to feel warm and dizzy, and began to lose my breath. The room started to spin and I felt like I was going to pass out. Every time I took a breath, I felt like a fish out of water gasping for air. I had an overwhelming urge to get out of the room, so I quickly fled. I sat in the bathroom for 15 minutes, sure that I was dying, embarrassed for having made a big show. I eventually pulled myself together and went back into class, where I apologized to the teacher afterwards, saying I thought I was going to throw up. I honestly thought I had maybe overheated on my bike ride or that my allergies were just acting up. It wasn’t until a few years later with repeated episodes like this that I finally read about symptoms of a panic attack and went “That’s ME! That’s what’s happening to me!”. How did I know it was panic? Because every single attack was hallmarked by the uncontrollable urge to escape the situation I was in; a classic “fight or flight” reaction. 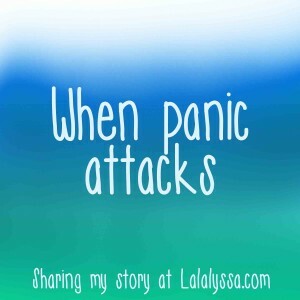 In 2013, I realized I was sick of my panic attacks interfering with my life. They’d hit me fast and hard, sometimes out of nowhere. I’d be in a meeting at work and have the familiar “can’t breathe” sensation, so I’d chug water or furiously scribble notes, trying to distract myself from thinking I’d soon pass out. I even had a panic attack one time while I was getting a massage. It was at this point that I decided I needed help. I went to a therapist, and found that I was indeed suffering from panic attacks, mixed in with a nice dose of generalized anxiety, which is categorized as irrational fear or worry about everyday situations. I worry about big, traumatic things like people I love dying, and less about stuff like “Does this person like me?”, but sometimes, I can’t get my brain to stop swirling with overwhelming scenarios. Flash forward three years, and while I still get the occasional panic attack, I know how to manage them, and because of this, they show up less frequently. I have treated myself both with medication and without, have read countless books, and have all kinds of strategies for soothing an oncoming attack or a barrage of yucky “What if?” questions. For years, I hid this diagnosis from my family and friends, ashamed that I couldn’t just pull myself together or get over it, convinced I was weak and crazy. Well-meaning but uneducated people would tell me to just “relax”, as if smelling a sprig of Lavender would magically unbundle the tense knots of adrenaline in my brain . Guess what? If you have anxiety, and I mean REAL ANXIETY, essential oils are not going to snap you out of it. Just like they can’t cure cancer. Why am I talking about this today? Because a three-star Michelin chef took his life. Because at my post-partum checkup last month, my OB never thought to ask how I was feeling, even though I’m high risk for postpartum depression or anxiety because I have a preexisting mental health condition. (I feel great, thankfully, but I’m angry that I wasn’t even asked, when science has now proven that PPD is strongly linked to dramatic hormonal shifts.) Because three of my closest female friends struggle with depression and are ashamed to seek help because they’re embarrassed. Because I just read that two high school girls in Plano, Texas killed themselves an hour apart, each of them secretly struggling with depression and anxiety. People who knew them quoted that they didn’t “seem depressed” at all. A few times when I have confided in people about my panic disorder, they tell me I seem “so calm”. I’m fortunate that I’m able to manage my disorder enough to live a normal life, but we never know what somebody is going through until we walk a mile in their shoes. We all know somebody who took their life because they couldn’t or didn’t seek help. It’s time to change that. I’m sharing this because when I was first diagnosed, I didn’t know anyone else who had panic attacks. The more I opened up, the more I found how many people experienced the same things I did. In addition, it was bloggers who made me feel less ashamed about getting treatment. In the spirit of passing it on, if sharing my story encourages just one person to get help for something they’re struggling with, then it’s worth it. We need to talk about mental health the way we talk about physical health. I am not broken. My body is not broken. It’s just different, a little overcharged, and that’s okay. The important thing is that I keep trying, that I continually work on my mental health the way we work on our physical health by going to the gym or eating well. I go to therapy twice a month, even if I feel great, because I know that my brain is just like any other muscle in my body, and it too needs to be worked. 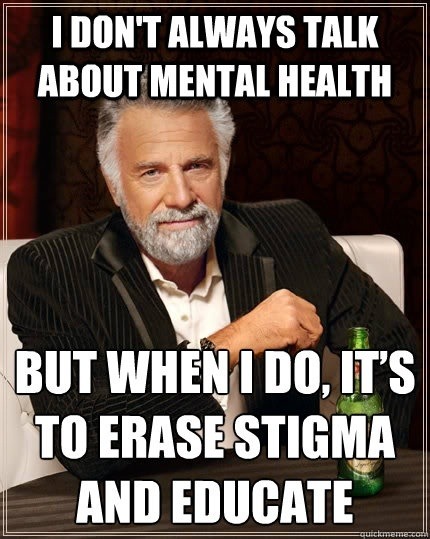 There is nothing to be ashamed of, and even though it feels like I’m screaming to the world that I’m “screwed up”, what I’m really doing is joining the ranks of millions of men and women who suffer silently with an anxiety disorder, depression, or some other mental illness that affects them in many, many ways. Please, please, please — if you are struggling with your mental health, get help. It’s hard to admit to yourself that you need some support, but it’s worth it. You are not broken. You are not crazy. You are worth the time and effort to feel better, and one day, you will.